This is imho an excessively beautiful figure! I keep staring at it getting thrills, and bliss pours over me as I explore its intricacies. This is evolution. What are we looking at? Fitness over time of all individuals in a population of size 100. The blue line is average population fitness. 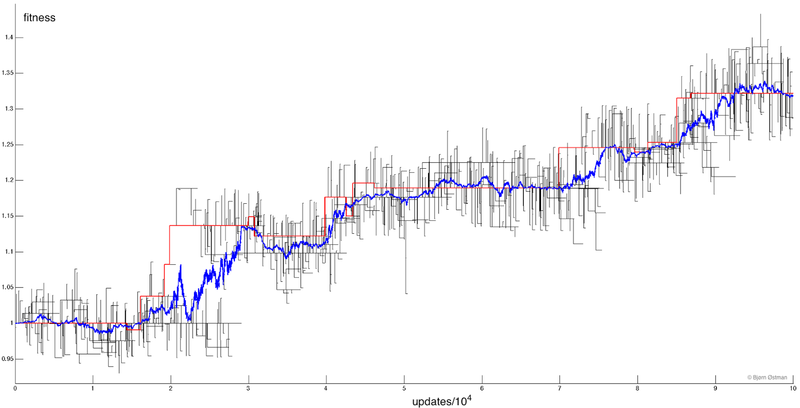 The red line is the lineage that leads to the most fit individual after 100,000 updates. And the real treasure? All the black lines which are all the other lineages that died out. Only the individuals who descend from the ancestor on the red line are alive near the end (technically, the most recent common ancestor (MRCA) is close to but obviously not quite at the end of the simulation). Offspring that have deleterious mutations (that decrease fitness) survive for quite a long time, and those individuals even have offspring of their own some times. In fact, we can see that there are even deleterious mutations on the line of descent (the red line goes down on five occasions). Offspring that have beneficial mutations (that increase fitness) don't always survive. In fact, most of them eventually die and those beneficial mutations are lost. Evolution does not imply survival of the fittest. Deleterious mutations do not prohibit evolution; deleterious mutations hitchhike on the back of beneficial mutations and go to fixation that way (there is no epistasis in this model). I made this simulation in Matlab. Constant population size of 100. Mutation rate of 0.01. Effect of mutations is drawn at random from a uniform distribution of selection coefficients between -0.05 and 0.05. One individual reproduces per computational update (Moran process), and chance of reproducing is proportional to fitness. Where did this figure come from? Is this your work? I love it! Post the citation (if there is one). Thanks! Yes, it is my work. My name is on the figure. ;) Code and figure in Matlab. I have enjoyed perusing this data as it explores a concept I have pondered in the past that of the role of luck in evolutionary genetics. For instance a drastic change of environment in which the least fit find themselves receiving the most fit condition in their new environment. Indeed a single occurrence of lightning having an equal chance of killing a fit member of a population as an unfit member. Furthermore this data hints at a deeper level of aggregate interaction within a population. What do you mean by "a deeper level of aggregate interaction"? I mean that, unlike is commonly implied, by common texts about the evolutionary process this data would suggest that members of a species are not always able to seek out the fittest mates based on their physical characteristics (we assume of course, this is how organisms chooses their mates). A result would be that individuals are less likely to be able to differentiate their fit and unfit prospective mates allowing even the least fit of creatures a position in the family tree of a particularly fit individual and that such individuals do not necessarily come from pure, fit blood. These data are from an asexual population, but sexual selection as you describe it could also exhibit the same stochasticity, yes.